Esri president Jack Dangermond praised the developers for doing the "real work" of building geospatial apps to solve problems. And he encouraged them to do their part to grow the tech community, urging them to commit to mentoring youth interested in geospatial technology. "We need to invest more in the people that solve the problems," said Dangermond. "A couple of years ago, I became friends with a very special person—will.i.am," Dangermond said. "He is not only one of the greatest entertainers in the world—he [cofounded] The Black Eyed Peas—but he is also a genius with respect to tech. He's building various kinds of wearable devices, and his development team is embedding geography into personal devices." Keynote speaker John Tomizuka answers a question after his presentation about building mobile apps. will.i.am said his efforts began after he attended a tsunami relief event several years ago. "I realized there is a tsunami every day in the neighborhood that I come from," he said. "It's a tsunami of neglect—no education, no funding, no type of real skill sets to prepare these kids for tomorrow." Today, many students in the i.am.angel Foundation's Science, Technology, Engineering, Arts, and Math (STEAM) initiative have increased their grade point averages and are busy building mapping and other types of apps and working on robotics projects. will.i.am said that he hopes the students use the computer and other tech skills they learn to improve their communities: "I would tell the kids, 'Don't try and get out of the ghetto. Let's try and change the ghetto forever. Let's be the [community] developers. Let's educate ourselves and transform our neighborhoods'." Geosolutions are desperately needed to tackle the world's big problems, Dangermond said. He urged the audience to take their cue from will.i.am and start to mentor young people. "Share your talent," he said. "A big interest we have is growing the next generation of developers—we need more of you." In the quest to produce geosolutions, Esri will continue to "open the hood" of ArcGIS technology to help geodevelopers build "great things," Dangermond said. Knowledge about Esri's code will be key. "Our technology is modular and structured into thousands of components. These are the components that Esri's developers use to build the platform," Dangermond said. "In the last couple of years, we've opened up that structured code—some with open source and APIs—so that you guys develop with exactly the same code that our own software engineers do." If geodevelopers go with the grain of the basic ArcGIS platform, it will be easier to create great mapping applications and other geotechnologies, Dangermond stressed. "We want you to be our colleagues in development of geosolutions and be part of the fabric of what we're working on. 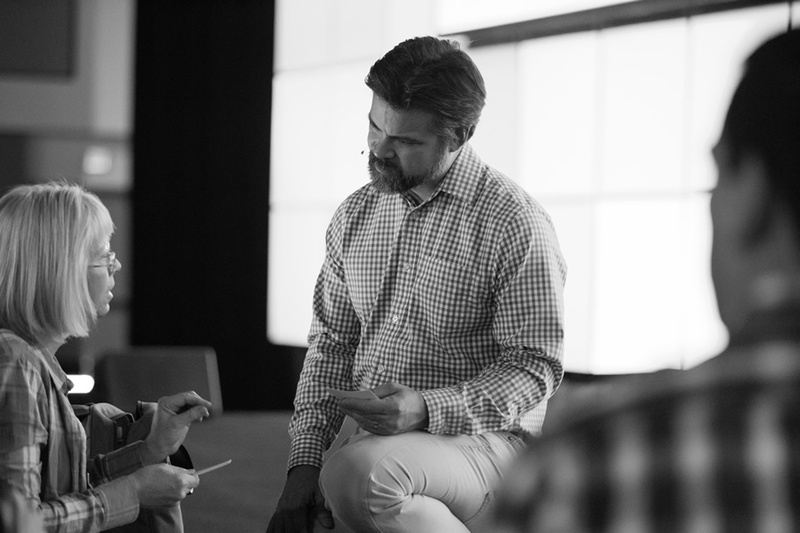 We are interested in building great tools that address the big issues of the world." Someone who is at the forefront of coming up with ideas and solutions in the mobile development world is John Tomizuka, cofounder and chief technical officer of Taqtile, a Seattle, Washington-based mobile app development company. His firm developed apps for President Obama's inauguration in 2012 and NBC's coverage of the wedding of Prince William to Kate Middleton in 2011. Before plunging into stories about the highs and lows of developing the various mobile apps he has worked on for Taqtile, he caught a dodgeball thrown by Esri ArcGIS program manager Jim McKinney, who moderated the summit. Tomizuka laughed and said, "Going along with the dodgeball analogy, for me, building mobile apps over the years is like getting pelted in the face. I don't want to discourage anyone, but it is a complex endeavor." Tomizuka said there are two types of mobile apps: narcissistic and empathetic. Avoid developing narcissistic apps, which are apps that appeal to you. Instead, work on developing empathetic apps that take into account your user's needs. "[Not] putting yourself in someone else's shoes . . . is deadly for mobile apps," he said. As an example of a narcissistic app, Tomizuka used an app Taqtile designed for the 2012 Democratic National Convention in Charlotte, North Carolina. The app included a logo of the City of Charlotte that users could take a picture of with their cell phone camera and get more information about the city. However, that idea was not driven by the user but by someone who worked for the city. "That's not thinking about your user. That's not being empathetic," he said. "This is a big success," said Tomizuka, adding that the app had 750,000 downloads and 500,000 monthly active users and generated a large number of purchases. 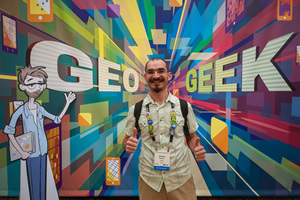 Christopher Moravec, director of products for Eagle Information Mapping in Houston, Texas, likes Esri's philosophy of working collaboratively with developers like himself while always upping the ante and improving ArcGIS. "I like the culture of the company—to push the [technology] limits. I was not always necessarily happy, but it got better—faster, easier to use, and more configurable," said Moravec, whose firm creates data management and analysis tools for companies with oil and gas pipelines. A collaborative relationship also makes developing geospatial solutions easier, said Moravec, who uses the entire ArcGIS platform, with ArcGIS for Server as the cornerstone. "I'm focusing on my industry and my needs, while Esri provides basic functionality such as the mapping, disconnected editing, and analysis [tools]," he said. "Esri does the hard part, and I do the fun part." Moravec and the other attendees look forward each year to hearing about Esri's new GIS technology. 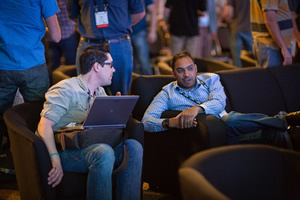 They weren't disappointed by what Esri director of software development Sud Menon, McKinney, and their team of software engineers brought to the stage. Menon kicked off the technology demonstrations by providing a holistic overview of the ArcGIS platform. "You will see a lot of exciting things today," he said. Menon explained how the platform includes ArcGIS for Desktop, apps, and APIs powered by ArcGIS Online and ArcGIS for Server in the cloud or an organization's infrastructure. "We have been working hard on building a cohesive platform that knits all these elements together." Menon highlighted Esri's new 3D web GIS technology, including web scenes that represent 3D maps. Scene layers represent features displayed in 3D including points, lines, polygons, objects, and meshes. "You can also work with map and image tiles and dynamic map and image layers," he said. Menon emphasized the platform's ready-to-use maps, apps, imagery, demographic information, and other data Esri offers. The apps include Esri Story Map apps, Explorer for ArcGIS, templates, Operations Dashboard for ArcGIS, Collector for ArcGIS, GeoPlanner for ArcGIS, Esri Maps for Office, web scene viewer, ArcGIS Open Data, and a crowdsourcing solution template. "For me, you can't walk away from here without being inspired," said Sellsted, who used the developer edition of Web AppBuilder for ArcGIS to build a custom measure widget for his organization. The widget provides a running total measurement of area units such as square feet, square miles, or hectares or distance units such as feet, meters, and miles as segments are being drawn. Measurements appear on the map after drawing a line or freehand polygon or dragging a polygon, line polyline, triangle, ellipse, circle, or extent onto it. "[The widget] also leaves those measured dimensions on the map so it can be printed," Sellsted said. Sellsted took advantage of some hood popping on Esri's part. "This was based on an [Esri] draw widget," he said. "I copied the code in order to create a new kind of measure widget." Smart mapping helps people quickly make maps that are highly useful and visually beautiful given the data they have in hand. Smart mapping, with data-driven workflows, provides smarter initial settings for the map that's being made, including color, scale, and styling. "Some cartographic options just aren't appropriate," said Mark Harrower, an Esri product engineer. "The software is offering the right choices at the right time." Moravec said that having to build an app only one time for all the platforms will be a huge time-saver. "It's a ton of work to build a really good app," he said. (AppStudio for ArcGIS) turns making a good app into weeks instead of months." In closing the technology demonstrations, McKinney told the audience that he thinks they would agree that in 2015, Esri will have a huge amount of innovation and capabilities for developers in place. "Think of the entire platform as your development space," he said.